Contest: Enter for your chance to win 2 FREE tickets to hang at Gillette Stadium with Gronk for Fantasy Sports Fest! 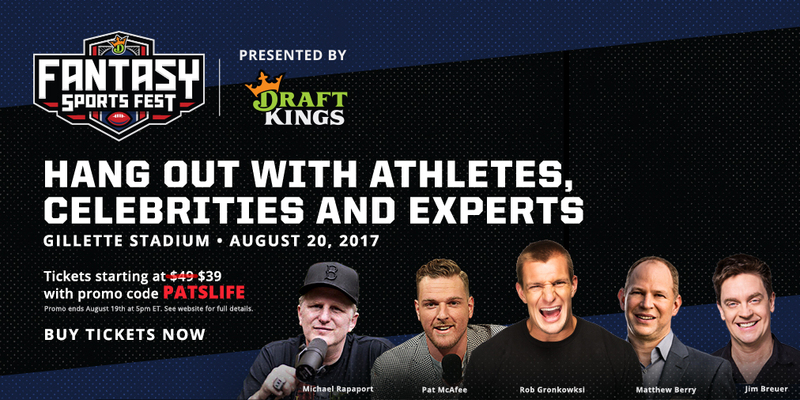 Have you ever wanted to hang with Rob Gronkowski and Barstool’s Pat McAfee while showing off your fantasy and football IQ? Now you can! Enter your information below for a chance to win tickets to this years’ Fantasy Sports Fest Presented by DraftKings this SUNDAY, AUGUST 20 at 10:30am! Don’t miss Michael Rapaport’s live taping of his stereo podcast IAmRapaport and watch Matthew Berry and Jim Breuer combine comedy and football for a one-time-only show. This is your shot to hit the field and put your skills to the test, combine-style, at the home of the five-time champions. Find out if you can hang with the best of the best at Fantasy Sports Fest presented by DraftKings!